Name aside, not all that much appears to have changed with the new Galaxy Watch. 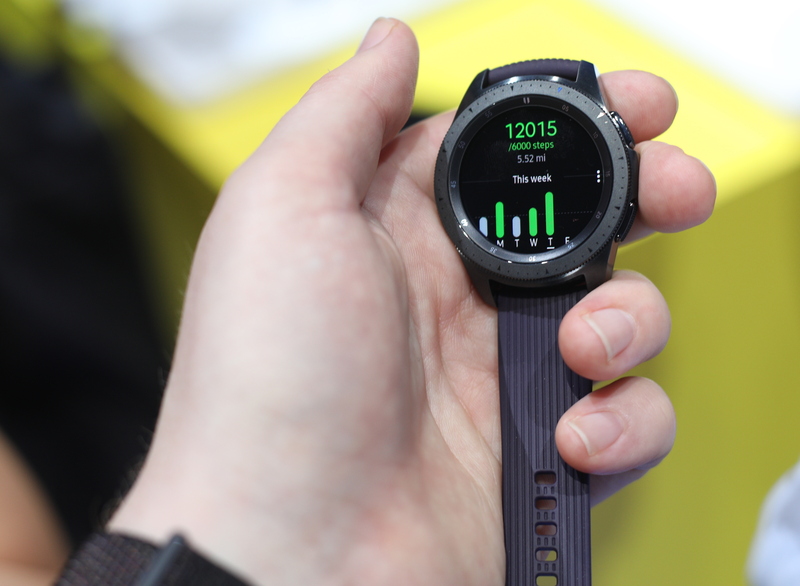 Samsung’s clearly used the Gear Sport as the jumping off point here. And that’s a good thing. Since the beginning, Samsung’s wearables have been plagued by a size issue. They’re huge — big on my wrists, even, and I’m 5’11. That rules out a pretty massive potential user base right out of the gate. The Galaxy Watches on display appeared to be the smaller of the two, at 42mm, which fit pretty comfortable on my wrist. There’s also a 46mm for those diehard big-watch fans. Samsung has yet to introduce a size for even smaller wrists, but this is certainly a step in the right direction. Those earlier rumors that the company would be jumping to the more widely used Android Wear operating system were off-base. Samsung’s sticking with Tizen here, with the Galaxy Watch running version 4.0. Not a huge surprise, of course. Samsung’s taken ownership over the open OS — moving to Google’s would feel like starting from scratch. The industrial design is also similar to earlier models, with a well, pronounced metal case and large buttons. There are two color designs, however, so you can opt for rose gold for a bit of a softer touch. And, of course, there are a whole bunch of different band options to further customize it. LTE functionality is present here — Samsung beat Apple to the draw on that one. The watch is also 5ATM + IP68 water-resistant and features a Gorilla Glass face, so it can take a licking. Like the rest of the wearable world, health is a big feature here. There are six automatic exercises (walking, running, cycling, elliptical, training, rowing and dynamic workouts), plus sleep tracking and breathing reminder. Speaking of sleeping with the thing on, the company promises “several days of usage,” but that will depend in no small part on which size you opt for. The battery sizes are 472mAh and 270mAh for the 46mm and 42mm, respectively. So that’s certainly a point in favor of opting for the largest one possible. We’ll no doubt be testing that, along with everything else, soon. For now, I’m not seeing any features that really stand out from the rest of the wearable masses. The 46mm runs $350 and the 42mm version is $330. Pricing on the LTE models will be carrier-dependent (AT&T, T-Mobile, Sprint and Verizon are all repped here). The device is launching at some unspecified time later this year.